Kingdoms at War • View topic - Play Kingdoms of Heckfire for Exclusive KaW Rewards! Play Kingdoms of Heckfire for Exclusive KaW Rewards! 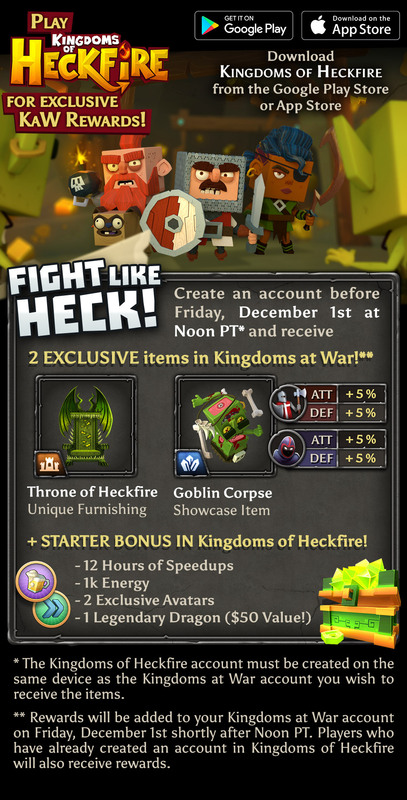 ****Grab your Heckfire bonus from the Chest section of the Heckfire Store BEFORE Noon PT on Friday, December 1st. The Chests are called "Android Chest" or "Apple Chest" depending on your device. Re: Play Kingdoms of Heckfire for Exclusive KaW Rewards! The hell?! We don't want KoH decor dammit. Is this where all the support is going to? What makes you think we will like this game when you can’t even support us in KaW? CheeChee wrote: Is this where all the support is going to? What makes you think we will like this game when you can’t even support us in KaW? Not at all. The KaW team is entirely separate from the Heckfire team. I hope the support team actually takes care of their players on Heckfire. Have you thought about recycling the support team for KaW. Would be nice to get responses that are not copy pasted. Also actually follow through on things you commit to. 2000 nobility and you have a deal. Wait - - nah - - LOL. Will the beta testers that long since stopped playing get the rewards as well?